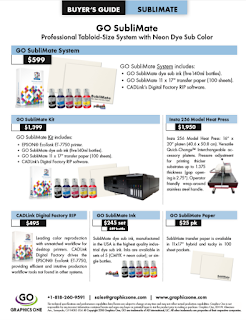 What makes GO NeoTack different than other dye sublimation inks? How many dye sub ink colors are in the NeoTack family? The GO NeoTack inkset offers twelve colors including traditional Cyan, Magenta, Yellow, Black, Light Cyan, Light Magenta, Neon Red, Neon Yellow, Neon Blue, Super Black, Orange and Violet. What is the difference between fluo or fluorescent digital dye sub ink and GO's neon dye sub inks? The American Screen Printing Association defines fluorescent inks as special inks which contain extremely bright “neon” pigment colors. Within digitial dye sublimation the term fluorescent is used by different companies to mean different things. For example, Sawgrass Technologies offers fluorescent colors which are invisible in natural light, but become visible when exposed to a black light. Most other fluo dye sub inksets are recommended for spot color use only, such as Sensient, not for combining with other colors in their inkset. GO’s neon dye sub inks use neon pigments and offer the ability to image both spot and composite colors and with no black light needed to see the truly outrageous colors. Can GO's neon inks be used with the other colors in the inkset? GO’s NeoTack can be used in both a spot color capacity and also to create composite colors. In fact, in a four color inkset users are astounded with the incredible range of colors produced by NeoTack ink. Does NeoTack only come only in neon colors? No. GO NeoTack has traditional CMYK inks as well as the added colors. There are a total of twelve colors. Can you use GO NeoTack Neon Colors with dye sub inks from other manufacturers? We do not recommend it. GO NeoTack is recommended only for use with the NeoTack family of dye sub inks. Can neon inks impact a four color printer? Yes. We have users who use traditional CMK colors with Neon Yellow. The use of Neon Yellow when combined with traditional CMYK offers incredible neon Reds, Limes, and Yellows. How much is the color gamut extended with the use of GO NeoTack Neon inks? When using either 4, 6 or 8 color configurations with GO neon inks, a user can expect an expanded color gamut of between 30-40% greater than a standard dye sub inkset. What is the difference between GO Super Black and GO Standard Black? Generally we recommend that users print with GO Super Black ink as it is provides a true deep black without any tints. In situations where lighter black is needed, we recommend using the standard black. What is the shelf life of GO NeoTack? Which printers work well with GO NeoTack Dye Sub Ink? GO NeoTack was developed for all printers using EPSON printheads and works especially well with Mutoh ValueJet 1628W, Mutoh ValueJet 1624W, Mutoh RJ-900X, and GO's AquaMax Dye Sub printers. What happens in a four color printer if neon yellow is being used and traditional yellow needs to be used (for example if you need a mustard yellow color)? The simplest way to change the ink is to take out the neon color InkPack (or any other NeoTack color) and insert the replacement color InkPack. Once this new color is inserted we recommend printing a solid color of the replaced ink so that the old color ink will be printed out of the printer’s ink delivery system. Are all twelve NeoTack colors compatible with each other? Yes. The entire set of colors are compatible to each other, including the neon colors.